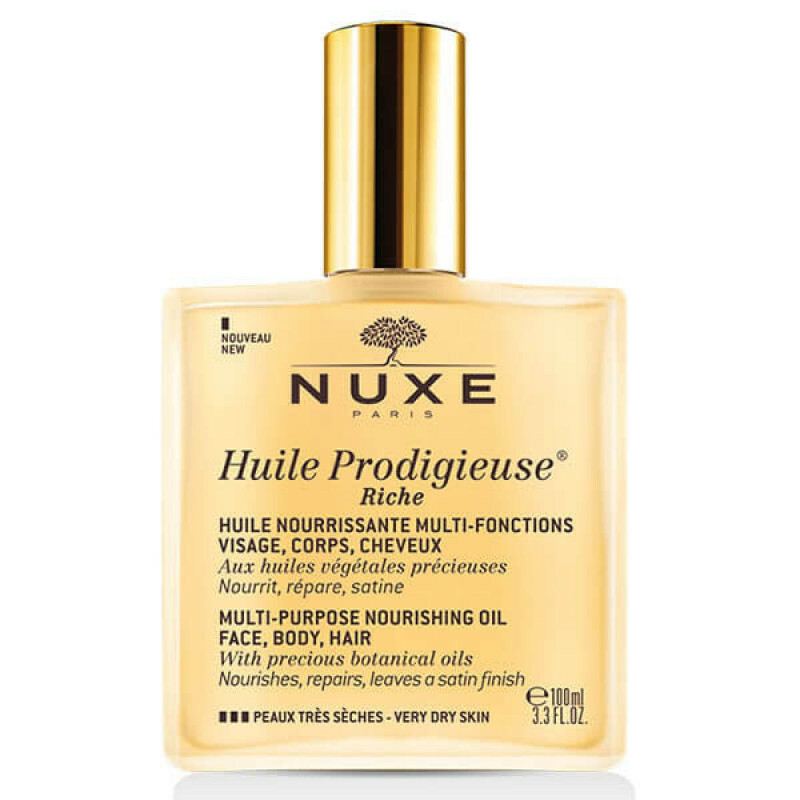 Nuxe Huile Prodigieuse Riche Multi-Purpose Oil 100ml is a multi-purpose nourishing oil for the face, body and hair. It is ideal for the care of dry skins. This rich oil in spray is formulated based of vegetable oils: Tsubaki oil, Sweet Almond oil, Camellia oil, Borage oil, Hazelnut oil, Macadamia oil and Argan oil. It repairs, nourishes and smoothes your skin without leaving any oily or sticky effect. This oil contains 98,1% of ingredients of natural origin. 100% precious oils. Formulated with silicon free. Caprylic/Capric Triglyceride*, Macadamia Integrifolia Seed Oil*, Decyl Oleate*, Oleic/Linoleic/Linolenic Polyglycerides*, Prunus Amygdalus Dulcis (Sweet Almond) Oil*, Corylus Avellana (Hazel) Seed Oil*, Camellia Oleifera Seed Oil*, Parfum/Fragrance, Camellia Japonica Seed Oil*, Tocopherol*, Argania Spinosa Kernel Oil*, Borago Officinalis Seed Oil*, Tocopheryl Acetate, Helianthus Annuus (Sunflower) Seed Oil*, Rosmarinus Officinalis (Rosemary) Leaf Extract*, Polyglyceryl-3 Diisostearate*, Ascorbic Acid*, Solanum Lycopersicum (Tomato) Fruit Extract*, Benzyl Salicylate, Linalool, Limonene, Citronellol, Geraniol [N2214/A]. On the face: Apply once per day by smoothing movements from the center to the face contour. Can be used alone or by mixing a few drops in the palm of your hand with your daily care. On the body: Massage by circular movements on the desired areas (chest, legs,...). On the hair: On dry hair, spray some drops in the palm of your hand then apply on the lengths as often as necessary. For an intense care, apply once at twice per week as mask during 10 minutes before the shampoo.